Relationships are some of our most important interactions as humans. All the relationships we experience can reflect in how we create partnerships, families, organizations, and communities. 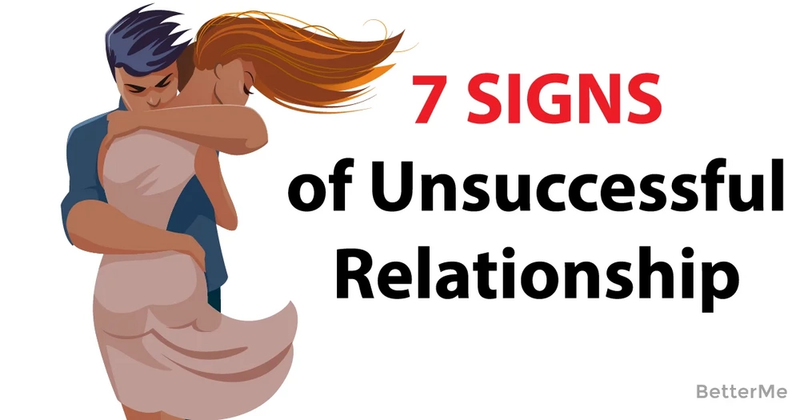 While all relationships go through ups and downs, it is always important to know whether your relationship, be it personal or professional, has become unsuccessful. It is easy to recognize in the earliest stages that a friend is in a toxic relationship but what if it is you who is in a bad relationship? It is very common to become blind. You stop noticing all the drawbacks and start to ignore signs telling you that a relationship may be harmful. If your partner goes through your phone or reads your emails, it means your relationship has lost its trust. If your man invades your privacy like this, he doesn't respect you. If your man doesn’t like the style of the clothes you wear, your makeup or haircut and he tells about it all the time, that’s a warning sign for you. Your man doesn't have the right to tell you how to present yourself. If your partner doesn't let you see your friends and gets angry about it this is a bad sign. No one can prevent you from meeting with your social circle or your friends and family. #4. You're Afraid To Express Your Opinion. A healthy relationship should be based on trust, honesty, and respect. If you can't be honest with your partner, it may be a sign that you need to rethink your relationship. A man, who loves you, won't insult you at every opportunity he gets. If he does this, then you are in a toxic relationship. Remember, that you deserve compliments from a man that will make you laugh and let you shine by his side. It's important for you to be financially independent. If your man controls how much and in what way you spend your money, you might be in a toxic relationship. If you want to protect yourself in case of a break-up, stop being dependent on someone else. If your best friend tells that you seem unhappy because of your relationship, he/she is probably right. You may be blind and don't want to see it. You should listen to the people who love you.